My mother in law has this great soup that is really easy to make and very health friendly not to mention cheap! Combine 1 pkg. 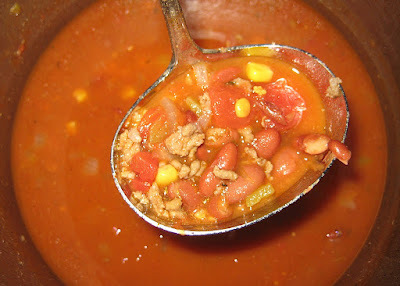 taco mix, 1 pkg ranch dressing mix, 1lb hamburger meat (coooked & drained), 1 can chopped tomatoes, 1 can mild rotel, 1 can corn (drained), 2 cans pinto beans, 2-3 cups water. Simmer for 30 minutes or warm in crockpot. Submitted to Tasty Tuesday, Tempt my Tummy, Tuesdays @ the Table, and Crockpot Wednesday.